Salads are one of my favourite dishes to make when I’m at home in the kitchen, and we’re not talking a bowl of lettuce here, but a big hearty salad with lots of fresh ingredients. When you spend as much time on the road as I do and consuming endless bowls of pasta and rice, there’s nothing better than a big plate of healthy greens and lots of nutrients to give your body a cleanse from the multitude of race food that we need to consume at races. The beauty with salads is you can be so creative and come up with many different combinations depending what you’re craving and which ingredients are in season. 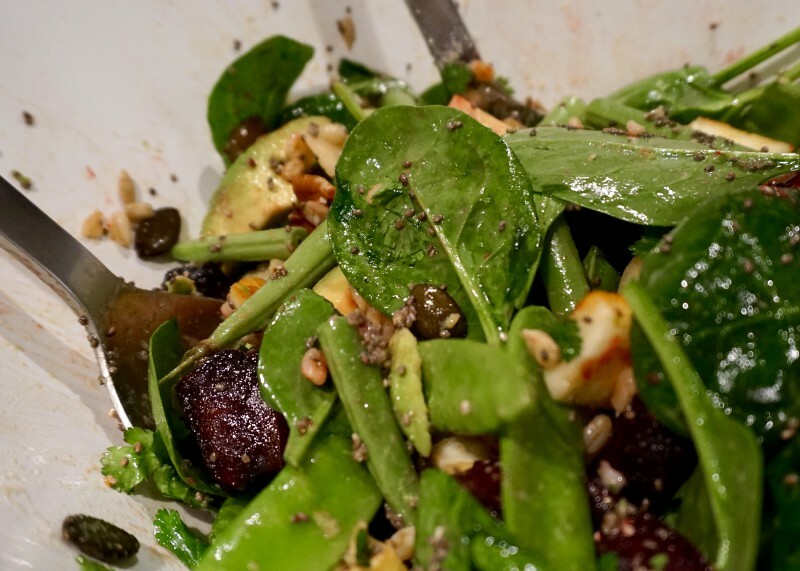 A little tip when creating salads, always add a grain or similar such as barley, rice or quinoa as this helps to fill you up and means you aren’t missing out on the carbs needed for your training. If you’re looking for ideas for your next salad creation, try out my seared tuna steak and green bean salad! *Note – Amounts are dependant on how many people you are making it for, the beauty with salads is you can pretty much toss in as much as you like of each ingredient dependent on personal taste and preference. Cook the barley as per instructions and steam or roast the beetroot until it is soft enough to poke a skewer through easily and then put both ingredients to one side to cool. Heat a pan on high heat with a little olive oil and cut the halloumi into small squares then pan fry until golden on each side. Pan sear the tuna steak on both sides and then coat the outside with sesame seeds and cut into strips. Place all of the ingredients except the tuna into a large salad bowl and toss together with some olive oil and balsamic vinegar until well combined. Serve into bowls of plates and top with the tuna steak and garnish with a small handful of coriander and season with salt and pepper.